The Super Administrators or Administrators can export the email accounts of their Organization users either for backup policies or to backup an account before an employee leaves the organization. In certain cases, if the mail account's storage gets utilized, the admins can backup emails from that account based on a specific period of time before deleting older emails to free up space in that account. The Email Account export can be done for entire accounts or based on a specific period of time. The exported emails will be available in ZIP format in the Control Panel for a period of 30 days from the day of export. The entire account is generally exported when an employee leaves the organization, and if the administrator has to backup the account before deleting the account or clearing the emails. This backup exports and provides the emails in EML format compressed in ZIP files. The ZIP files have the exact folder structure that was available in the user account. The export will export only the emails that are available in that account at that point of time. The emails in Spam/ Trash will not be included in the backup. Ensure that you download the ZIP files from the Control Panel, before deleting the account. Once the account is deleted, the exported ZIP files of that account will also be cleared and will not be available for download. Log in to the Control Panel as Super Admin/ Administrator. Select Export Mail Accounts under Email Administration. Select Entire Account to export the entire account. Start typing the email address, to search and select the account for which you want to schedule the backup. You can also select multiple accounts, to schedule backup for multiple accounts. Click Begin Export, to schedule the export of email for the selected accounts. Once you click Begin Export, you will see a popup where you can create a password for the exported files. 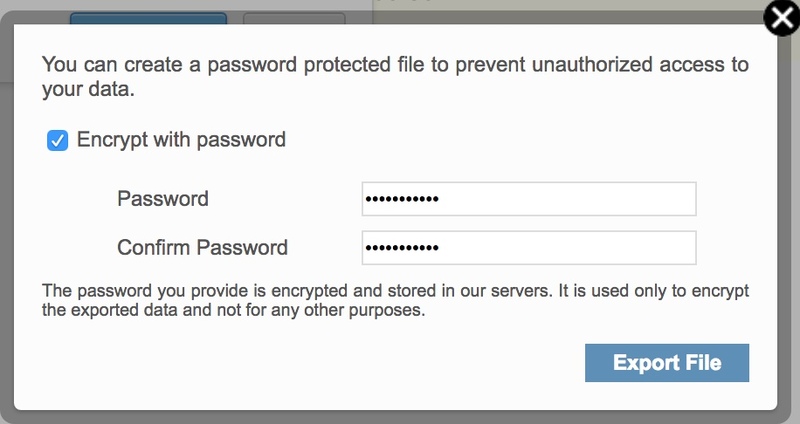 This is an optional step, and you can leave the Encrypt with password option unchecked if you don't want to password protect your files. Check the Encrypt with Password checkbox if you want to create a password for your exported files. Enter the password that you want to set for the files, and click Export File. Once the export process is completed, you will see a download link in the Status. Click the download link to view the list of Zip files available for download for each account. An email notification will also be sent to the admin and the user, with the links to download the available files. The exported zip files will be available only for 30 days from the date of export. The administrator can take period specific backups of the email accounts, as per the requirement of the organization policies. For any account, the administrator can create backup between selected dates by selecting the account and the dates from the section. To export emails based on a specific period, select the From Date and To Date, based on the period for which you want to export the emails. The exported files will be available only for 30 days from the date of export. The users can log in to their own accounts to export emails in a particular folder or a set of folders The options to Export the emails in their account are available under the Import/ Export section in the Settings. However, the administrator can restrict the Export of emails using the Access Restrictions section of Mail Policy. You can use Incoming Email Forwarding and Outgoing Email Forwarding, to save a copy of the email that arrives to the account and the emails that are sent from the account. You need to create two user accounts in your organization exclusively for this purpose. Ex: backup.in@yourdomain.com and backup.out@yourdomain.com. You can forward all incoming emails to the backup.in account, by configuring Email Forwarding from the Control Panel. The outgoing forward is mainly based on outgoing forward policy. You can create an outgoing forward policy and configure backup.out@yourdomain.com as the account to be used to maintain a copy of outbound emails. Then you need to apply the policy to the users, for whom you want to have a backup of the outbound emails. Refer here for detailed information about Mail Policy. When you configure multiple accounts to be forwarded to the single accounts, make sure that the 'Backup' accounts have sufficient storage to handle the volume of emails.